Customized First year photo gift for baby. 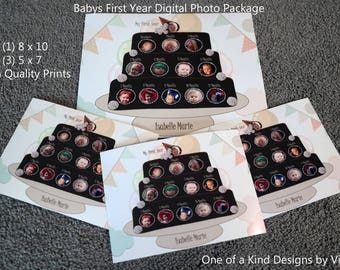 Digitally designed first year photo gift - Your baby's photos and our unique template & frames. We designed for you! No fussing with or cutting prints up. These are one of a kind custom cake designs by Vicki D. and sure to please the parents and grandparents who receive them. Chocolate cake with white snow cap decorations and baby's first 12 month pictures. Strawberry cake with colorful snow cap decorations and baby's first 12 month pictures. We will customize the design of your choice with pictures of your baby’s first 12 months! 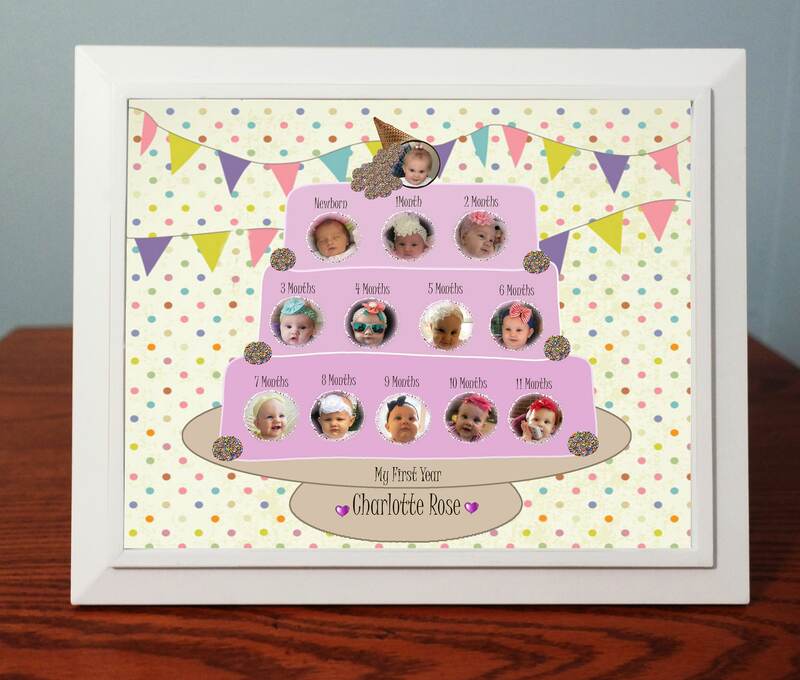 Each month or picture slot will display a picture of your baby and we personalize the photo with the baby's name. This is a great baby shower gift, 1st Birthday gift for parents and grandparent as well as Aunts and Uncles. Please refer to the product listing example for a better visual understanding of how we will create your gift. The photos shown in our example were taken from a grandmother’s cell phone and then sent to us via email in a jpeg format and they look great! Most parents these days take monthly photos which they could easily send to us via email. We will ensure they are digitally edited and cropped to fit the baby’s face wonderfully onto each month’s snowcap cake decoration! This purchase includes (1) 8 x 10 professional print with an 8 x 10 frame of your choice. After completing your transaction, you will receive an email from our designer to work with you to begin the creation process. Basically from then on you will be sending your baby’s photos in jpeg format via email to our designer simply noting which month the picture belongs to of your baby. If you would like to purchase a gift certificate please call us directly at 302 892 2572 so that we can assist. WE WILL provide you with a gift certificate coupon that has all of the important information needed along with a photo description, so that you can present the details to the recipient of the gift. You can also initiate a conversation through Etsy. The creation process usually takes 5 - 7 days once all photos have been received. If you have a deadline, please let us know. Do not hesitate to call us at 302 892 2572 with any questions. This is an original concept and digital design by Vicki D. and should not be replicated.